Until driverless truck technology becomes a reality, in maybe seven to 10 years, big rigs like this will still need people to operate them. HIGH POINT — A nationwide shortage of tractor-trailer drivers that shows no signs of abating is threatening the logistical infrastructure of the furniture industry, along with any sector that depends on road transport. The problem stems from an aging truck driver work force averaging in their mid-50s, and a work lifestyle that puts driving a big rig pretty far down on most young people’s preferred career options. The turnover rate for drivers at large truckload carriers — those with $30 million-plus in annual revenue — rose a percentage point to an annualized rate of 97% in third quarter of 2014, according to data released in late January by the American Trucking Assn., the largest national trucking trade group. It’s not just the big guys who are hurting. Costello said the turnover rate at less than-truckload carriers rose from 11% in last year’s second quarter to 13% in the third. 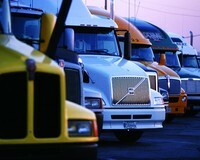 The turnover rate at small fleets remained unchanged at 94%. Bottom line: If current trends continue, the U.S. trucking industry will face a driver shortfall of some 240,000 positions by 2022, according to freight analytics specialist FTR. Ashley Furniture considers its logistics management perhaps the most important factor in its ability to service sales of about $3.7 billion last year. It says it benefits from operating its own fleet of some 800 trucks and 2,500 trailers. Its driver retention far outstrips the trucking industry average — more on that later — but the current and future shortage of qualified drivers is a problem. That’s because that while Ashley is able to handle 50-55% of its own truck freight, that still leaves more than a billion dollars’ worth of merchandise that has to find a home on other trucks if it’s to reach the customer. “This is the biggest driver shortage I’ve ever seen, and I have almost 60 years’ experience,” said Duke Schultz, director of business development and manager of Ashley’s trucking operation. Those third-party carriers, which range from companies rolling 20 trucks to those with thousands, are definitely feeling the driver crunch. While it deals with outside freight brokers to arrange loads that avoid dead-heading trailers coming back to its distribution centers, Ashley has the infrastructure and experience in place so it doesn’t rely on third-party logistics providers when dealing with freight partners. That’s not the case for a lot of vendors, or retailers whose stores serve a wide geographical area. Their 3PL partners are affected by a driver force that’s aging out without getting replaced fast enough. “The shortage of qualified drivers continues to be our No. 1 operational challenge,” said Rob Davis, director of business development at Diakon Logistics, which handles a lot of “final mile” delivery for clients. “It impacts everything from the business we bid on to how we recruit, train, retain and manage our fleets. We’ve turned down attractive business opportunities only because of how difficult the recruiting environment is in that area. We have to get very creative where and how we recruit so that we attract quality candidates. It’s a very unique workforce to locate because of the requirements, and the retention rate is much lower compared to other labor jobs. “Being a delivery man is exactly like being a professional athlete except there is no off season, no indoor stadiums, and oh, the pay isn’t as high. It’s physical, fast, and one accident can ruin your career,” Davis said. The driver shortage does present opportunity to large 3PLs such as XPO Logistics, which has been adding access to trucking capacity through acquisition and network growth. Bill Smith, vice president of sales at Globe Express Services, agreed there’s opportunity for 3PLs. Steve Wolfe, vice president of global supply chain and logistics at importer Stanley Furniture, said the High Point-based company has benefited from having so many specialized furniture careers in the area. Malat at XPO said that at some point industry-wide capacity is likely to tighten dramatically, raising the cost of transportation. That could have an effect on the shortfall of drivers. “At some point, higher prices will spur the trucking companies to raise driver wages to a level that attracts an influx of new drivers,” Malat said. According to the federal Bureau of Labor Statistics truck driver wages averaged $40,940 in 2013, the latest year for which the figure was available. “One possible solution is for the transportation industry to make a concerted effort to attract young people as drivers and owner-operators, and incent them to make a career of it. Right now, the demographics are working against the industry. The average age of a commercial truck driver is 55, which is when many people start planning a path toward retirement,” Malat said. XPO is leveraging technology to contact tens of thousands of carriers and tap into available capacity. “We firmly believe that technology is the major differentiator of 3PLs and the future of logistics — that’s why we’ll spend over $125 million on IT this year,” he said. He said he believes one of the most exciting developments in the next decade will be driverless trucks. The need to make “truck driver” a more attractive proposition for a younger age demographic came up often during interviews for this report, and Ashley, for one, has made strides in that regard. While large-carrier turnover approaches 100%, Ashley’s runs 14%, and a shade over 8% of that is due to retirement, according to Schultz. Why are the numbers so low? Top-notch equipment is a start. Other benefits include an on-site medical center with a $10 co-pay and many common prescription drugs available immediately; a 401k plan; a $3,000-a-year driver safety bonus and mileage plateau achievement recognition; and constant training and updates on regulatory procedures. In addition, tight operational planning gets drivers home on a regular basis. “Most of our drivers are home for the weekend, and in some cases a couple of nights during the week,” Wanek said. Still, while Ashley might shine in driver retention, its drivers average in their late 40s — younger than the industry average, but still closer to retirement than the start of their career. There’s still work to be done to attract the next generation of drivers. Schultz said that in his career before Ashley, job applicants in their 30s were exceedingly scarce.